For CPM's release, i own the 3 mini sets of volumes 1-4, 5-8, and 7-11. Unless i am missing something, the OVA is probably another separate release which i didn't get/missed out on. It is, and so is the New Files. I see, well i guess i missed out on the OVAs (I & II) since i was just collecting Patlabor to add to my collection at that time. I am expecting/hoping that Sentai will license the 2nd OVA as well. Well, WTK was sort of suggesting that there might be a connection with Madman's AU license of Patlabor. Since Madman picked up the original OVA, the TV series, and the second (New Files) OVA all at once, that might suggest that Sentai has the rights to all three. The Sentai solicitation also refers to this Patlabor release as the FIRST Patlabor collection in the product description, which might be taken as another indication. 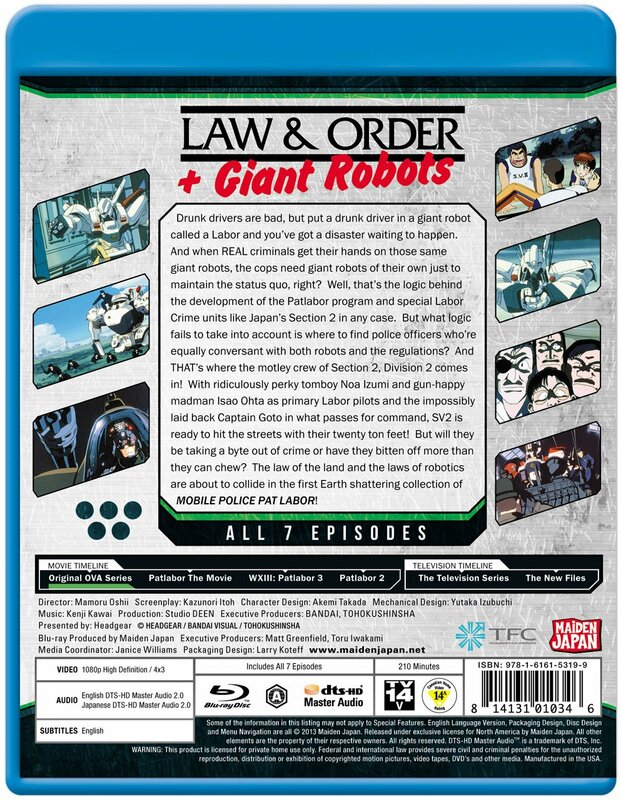 My interest in the Patlabor franchise is fairly mild, but I'll still be picking this up because pre-1990s anime do not get North American BD releases very often. In fact, I'm hard-pressed to think of ANY pre-1990s anime on BD that's not a film. While there are some films, Dragon Ball Z is the only other pre-90s TV/OVA on BD here and even that started in 89. After that it's Yu Yu Hakusho from 92. That's right, I forgot about DBZ; of course, Funi never finished their BD release of DBZ (it only got, what, two sets released? So only around 10% of DBZ...), but I guess there was something, incomplete at it may have been. Still a pretty good indication of how special this release is, though. DBZ is the obvious example I always miss because of how massively popular it was and still is. If they do release the rest, they'll probably go with two cour like the imports, unless something prohibits them from maintaining consistency with the JP release pattern. I doubt the franchise's licensing costs are prohibitive enough to prevent an identical release schedule. Though I wonder if they have MiniPato. Assuming they do and it's included with their release plans, it's likely it'll be an upscale since there isn't a BD, let alone a remaster of it in Japan. As for the movies, I'll consider them although I already have the import 1&2 BDs and the BVUSA DVDs (which unsurprisingly flopped hard). WXIII is a sure buy since I skipped the JP release. Already have Patlabor but might pick this up to show support for older, classic anime. Formerly Randall Flagg at AoD. Touch is still the greatest show ever. Avatar: Miyako and Yuno of Hidamari Sketch wish you a Merry Christmas. Now my Patlabor collection will be complete. Again many thanks Section 23. Wow, this was not expected. I've got these OVAs as well as the New Files, the tv series and the R1 dvd releases of all three movies (including Mini Pato). Even with that, I may end up double dipping on the BD release just to support it. This is quite amazing. I love my sons Lucas & Joseph! It's looking like Maiden Japan have the 3 movies, TV Series, and The New Files. 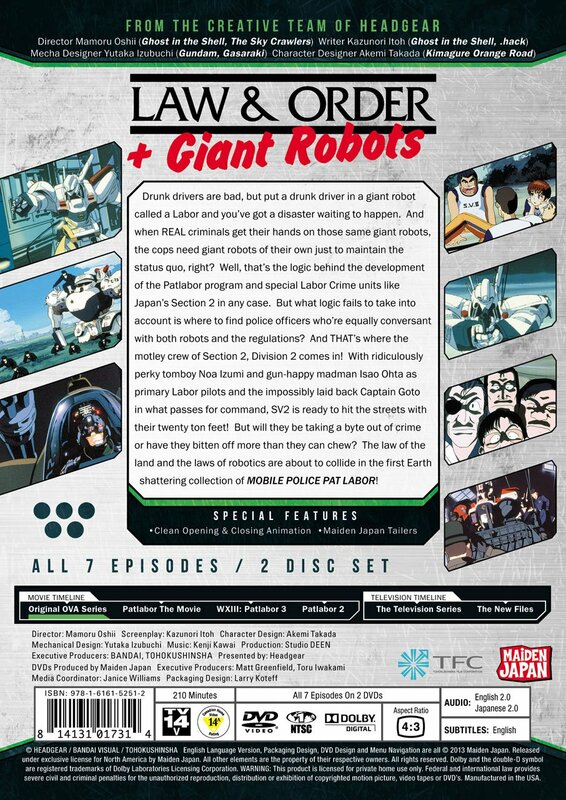 via DVD and Blu-ray back covers of Patlabor The Mobile Police: The Original OVA Series. I'll buy all of them if they're on Blu-ray. I'm really looking forward to the Oshii films in particular. I'm not sure that the fact that the back covers show the timelines means they acquired all of Patlabor, but I'd love to own the TV series and New Files on Blu-ray. I only didn't buy the Japanese sets because they don't include English subs, unlike the movies. It's a high probability they did. It doesn't make sense to be outlining the timeline with titles they don't have scheduled as part of their lineup. Doesn't guarantee they'll all be BDs though, but it wouldn't surprise me to see at least the movies in Blu. It'd be good if they do. I'm already double-dipping on the OVA series in BD & would gladly do the same with the rest. I'll definitely get the TV & New Files on either BD or DVD, preferably the former. If only YUA season 1 & movie (on BD) could be picked up, + Silent Mobius & Miami Guns as well. A small army of policewomen. Last edited by Njr Resurrection; 03-06-2013, 04:11 PM.